Love this cute card and love Prismacolor pencils. Thanks for the great video. Cute card. Took your advice and order the Prismacolor pencils! great set! Christmas to myself! LOL Have a great weekend. Sometimes “happy accidents” happen and I love that. Always enjoy your videos and love to see your techniques. Super cute vests on the reindeer and LOVE colored pencils on Kraft! Thanks for the generous giveaway too. I appreciate that some of your video is in real time so I get a better feel when I try the technique while I’m watching. Super fun card, Sandy. The reindeer look like real cool guys in their designer vests. I think the vests are perfect on the reindeer! That way their sleeves won’t encumber them! I really enjoyed watching you color with the Prisma pencils – that’s what I use – you have such an eye for what colors to use for the shading – I need more practice! The white really pops on the kraft too! Thanks for the giveaway – I would love to take this stamp set home! Hey sweetie! Thanks for the heads up on the Prismacolors. I was trying NOT to spend yesterday at all, but that was an awesome deal! Thanks for the chance to win this adorable stamp set. I don’t want to be included in the chance to win the Watercolors because I already own them and would like them to go to someone who doesn’t have them. Hope you are having a wonderful weekend and getting some rest in with your crafting time! Love your reindeer and vests–perfect for AZ, where we don’t get too cold! Thanks for giving me the idea of using my new color pencils for some of my Christmas cards I plan to make. I hope they turn out as nice as yours. Always love watching you color!! Cute card!! Love the reindeer card and many of your great ideas and techniques. Very inspiring. I really liked the paper. It is new to me. As always, I love watching your coloring technique. Love the stylish reindeer card! Sandy, you videos are so thorough! I am amazed at how much I have learned watching your videos. And these reigndeer are stinkin’ adorbs. Thank you for everything! Sandy – you list Environment Desert Storm cardstock; what is the difference between Environment and smooth? Most of the time when you and others mention using Neenah Desert Storm cardstock- that is all you say. I didn’t realize there were 2 different types until i went to add it to my Christmas list. Do you use both ? Wow love watching you color! I never would of tried purple for shadow. Thanks for video and for giveaway! 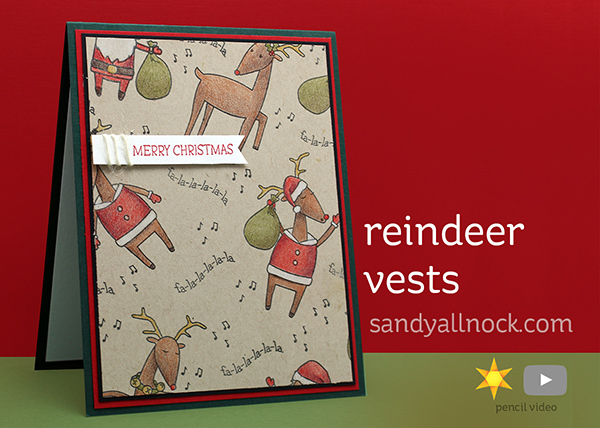 Sandy your card is so darned CUTE and I love these reindeer, vests and all. LOL Such a sweet set, thanks for the chance to win! You are such an inspiring artist. So giving of not only giveaways but sharing your talents. God Bless You! Fun video! Enjoy all the commentary on the set used and the pencil sharpener. Super fun stamp set! I can see a few ways to change up the coloring! Love what you did with it. I just caught a sale at Amazon for the Prismacolor pencils. I am so excited to ramp up my coloring! If I win this set, I’m making cards and tags for gifts. Just darling! Such a fun card@! Love the little Santa vests. Very nice card! Just love watching your videos. Fabulous! Still chuckling about the vests! I didn’t even notice that you might have colored the wrong thing by making his arms brown instead of red until you said something . It’s Art it’s supposed to be whatever you want it to be !! Look the funny story of the vests! Cute card. Love the “vests”.. And your jingle bell puppies. 🙂 Keep us posted on the puppies . Thanks for the heads up re: color pencils and the opportunity to get the stamp set. Also thank you for sharing your talent & expertise.. Thanks for sharing your coloring. There may be way to heat wrap pencils to repair the lead but not sure what type pencils this works for. May search youtube for ideas. Have a great day! Great card! I love the idea of vests for reindeer. Thanks for the heads up on the pencils. Too bad I’ve spent so much of my Christmas money already! Will pass this on to my sweet hubby! Thanks for all the great tutorials! Love them!! Love the card and the way you share your artistic talent! Thanks! Thank you for the video and sharing about the sale! The reindeer are too cute dressed up! I think vests make more sense for a reindeer, you know, like a dog sweater! Thanks for letting us know about the awesome pencil deal! Sandy,I’m thinking vests.They are super cute.The Prisms sale is great.Sometimes I cringe this time of year because I have to refrain myself for shopping and this one hurt.I’ve missed ya,Cancer has decided to show its ugly self here so taking a day at a time.Have a blessed Christmas. I think the vests are perfect for reindeer because they need their arms/legs in order to fly! Thank you for your post yesterday about the pencils on sale. I actually bought some other art stuff from Amazon as well for amazing deals. ALSO, thank you for posting about PetSmart’s sale. I get their online newsletter, but I often just overlook the emails without opening them. Your post reminded me to buy some holiday goodies for my two little dogs, Stormy and Sky. My little doggie-girls often get jealous & make noise when I’m trying to watch your videos. They want my attention focused on them & not on your videos. I think dogs just know how to “Press our buttons,” just the way small children do. Stormy & Sky say hello. Very cute card! As always, great video! Adorable card! I loved your video as I’m wanting to do more with colored pencils and need lots of help! Your tutorials are always fabulous! Loved this idea and the stamp set! Thanks for the gift list also and while I have the full set of Prismacolor pencils, I appreciate you taking the time to let us know about the sale. Keep up the good work, love to get your videos and especially love the “background noises” on them. Happy Holidays. love the pattern of your card and your pencil crayon tips. I absolutly love love this stamp set. Your cards are so much fun, I have my coffee in the morning enjoying your you tube videos everyday. Hope I win this one. Also I so appreciate your journal coloring bibles and uplifting to hear you share your fatith in Christ Jesus. Darling vests! Never would have noticed! Very fun card. Reindeer Vests, so cute, I think reindeer would rather wear vests instead of coats, anyway:) (easier to fly?) I can see why you had to have it. I’ve ended up with two sets before, too. I love watching your ‘real time’ magic…What a talent. I have to say I never would’ve thought your vests were anything else had you not mentioned it. Loved watching you color these in your video!! Super cute and pretty card! !